Given the choice, most litle girls love to dress up as princesses, angels and fairies, so if you're daughter has a fancy dress party coming up she'll love this simply gorgeous springtime fairy outfit. Included is a beautiful pink dress with a net overlay, layered skirt in a contrasting darker pink. There are green 'leaves' at the waist and on the shoulder straps and the bodice has feature piping. 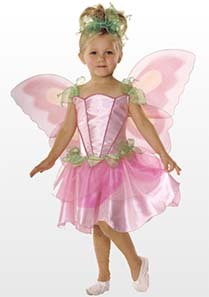 Also included are a pair of pink fairy wings and a green netted headpiece. Perfect for any party, dressing up box or Book Day event, this pretty costume is guaranteed to make your little girl feel fabulous. It's available in two different sizes (small / age 3-4 and medium / age 5-7). Just add a wand for the complete magic look.